Please help me find my 10 month old tiger cat! He went missing inside Cypress Creek Mobile Home Park. 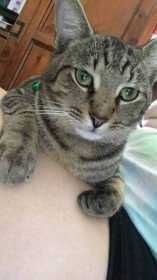 He has a blue & camo collar on, he’s a grey/brown tabby tiger cat. Black paws, green eyes. He’s a neutured male.